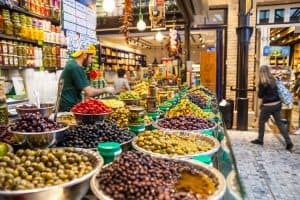 Don’t miss out on Tel Aviv’s busiest and most popular market! Although Tel Aviv has many markets, “Shuk Hacarmel” is a must see, Known for it’s fresh and high-quality produce. From high end and divine cheeses to exceptional butchers shops. One can also find clothing, shoes and other odds and ends amongst the hustling stalls. At the Carmel Market you can get a feel of the Middle Eastern sounds, smells and bargaining culture. When you visit, bear in mind that at times such as friday mornings, the market is packed, giving you less freedom to walk through the alleyways freely at your own pace. Open from 8am until the early hours of the night. On Friday the shuk closes in the early afternoon, earlier in winter, and is closed on Saturday.